The Latin American art auction sales in 2017, based on auctions at Sotheby’s, Christie’s and Phillips, experienced a 16.7% decline in value compared to 2016. The second half of 2017 totalled $25,797,100 (excluding buyer’s premium) which was 24.9% lower than the total value in the first half of 2017. 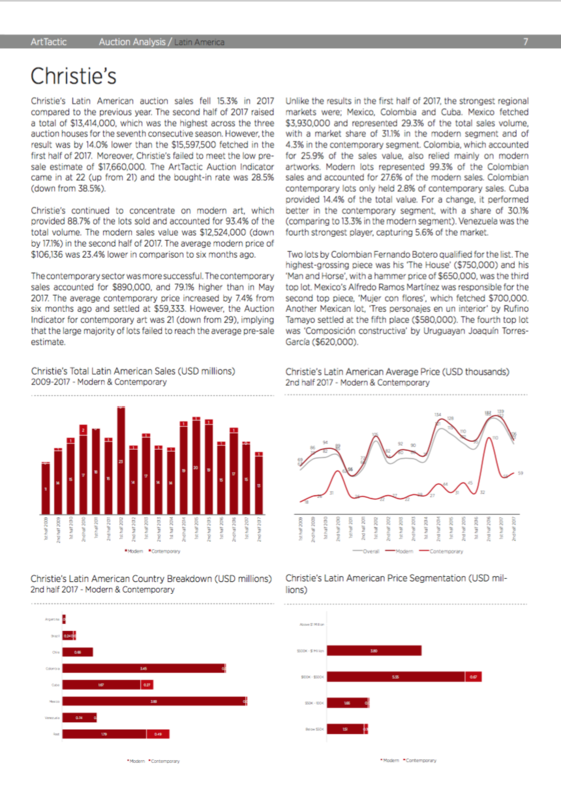 This report presents an in-depth analysis of Latin American sales at Christie’s, Sotheby’s and Phillips, and provides a comparison of auction trends between 1st and 2nd half of 2017. The analysis also provides analytical tools looking at 6 monthly trends between 2009 and 2017. 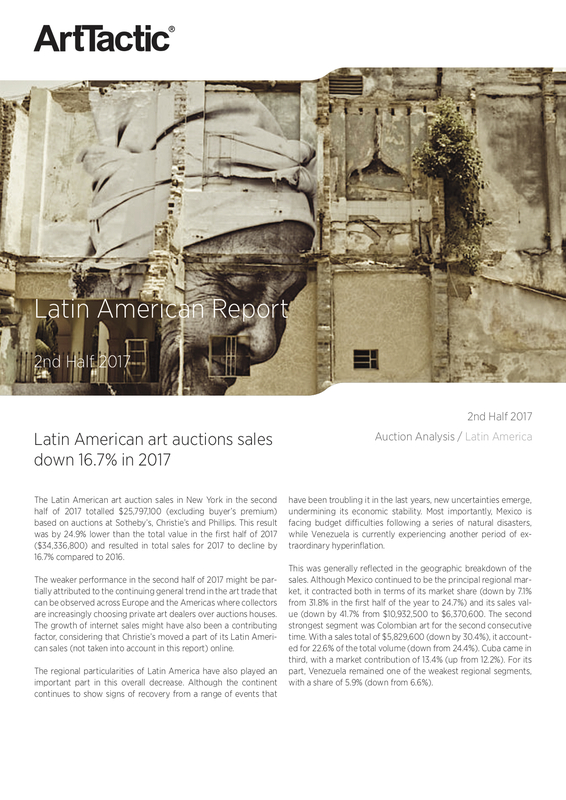 This report is popular among collectors, auction houses and financial investors, who want to get an in-depth understanding of Latin American art auction trends and follow the performance of the three main auction houses over the course 2017. 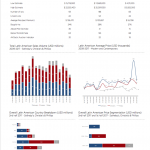 Poor performance in 2nd half of 2017: Latin American auction sales in New York was 24.9% lower than the first half of 2017. 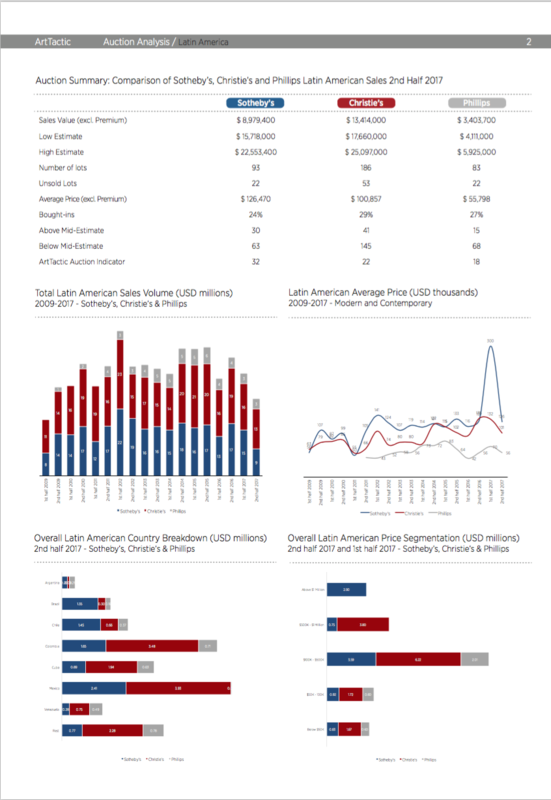 Latin American Auction Market resets to 2009: The total auction result for 2nd half of 2017 was the lowest since the first half of 2009 when the three houses totalled $18,878,340 in sales. Comparable Performance: Latin American auction sales performance comparison between Sotheby’s, Christie’s and Phillips in New York. Geographical breakdown and Analysis by Artist Country: Auction sales trends analysed by geographical location of artist. 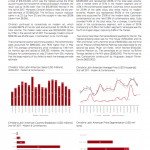 Price Segment Analysis: Breakdown by price segments for works sold in the Latin American Sales.